TV with Thinus: BREAKING. MultiChoice shutters the Oscar Pistorius Trial TV channel on DStv; channel will be dead until coverage resumes on 7 April. BREAKING. MultiChoice shutters the Oscar Pistorius Trial TV channel on DStv; channel will be dead until coverage resumes on 7 April. With no new content and fearing viewer fatigue from repeat over-exposure, the Oscar Pistorius Trial TV channel (DStv 199) on MultiChoice's DStv pay-TV platform has gone dark, telling viewers that the TV channel will only broadcast again from 7 April at 07:00. The Oscar Pistorius Trial TV channel on DStv lost anchor Subniv Babuta this past week who left South Africa (no announcement was made to the press), and also ran into two other somewhat unforeseen challenges which made it difficult to remain on air. Firstly the sensational Oscar Pistorius murder trial was extended from its original conclusion on 20 March - however TV with Thinus was last week told in response to a media enquiry that the TV channel would continue until the conclusion of the court case, whenever that might be. The extension of the trial - due to the time it took for witnesses to take the stand - means that the dedicated TV channel supplied to MultiChoice by Combined Artistic Productions would remain operational and in production for a longer period than originally anticipated. This means that MultiChoice will be utilising bandwidth and infrastructure for the TV channel for longer than originally scheduled. The cost of producing and running the TV channel will also be more. The Oscar Pistorius murder trial will now continue until at least mid-May. Secondly, an unexpected postponement due to illness of a court assessor - together with a public holiday, and more coming in April, as well as days where no court sittings took place - didn't help the Carte Blanche supplied channel. It forced the channel into multiple repetitive broadcasts of recorded, earlier court proceedings which has an adverse effect on viewer interest and impacts ratings. The decision was therefore taken to shut down the Oscar Pistorius Trial TV channel for just over a week, given costs, lack of new, rolling content, and the risk of viewer fatigue. 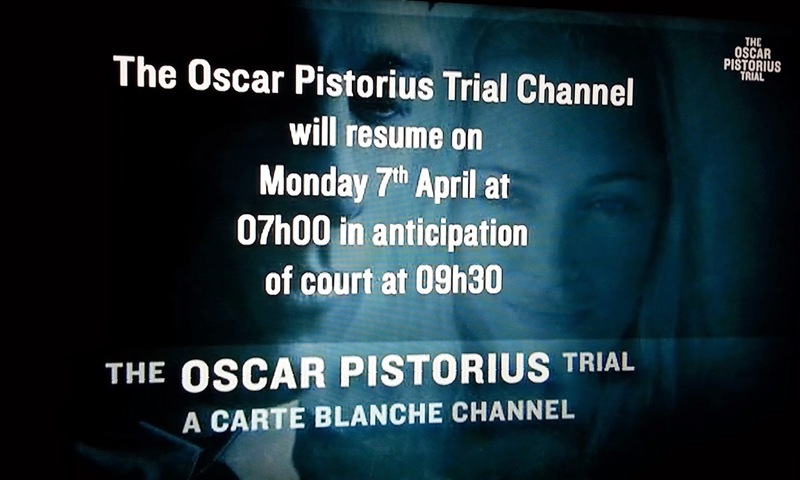 The Oscar Pistorius Trial TV channel which went live on 2 March, will start again on Monday 7 April at 07:00. No viewership figures were announced but the channel pulled around 190 000 viewers per day during the first week on air. MultiChoice says the Oscar Pistorius Trial TV channel will from now on "adjust its live broadcast schedule according to the court proceedings".